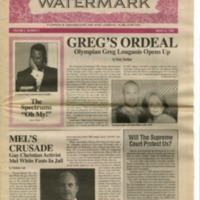 The eighth issue of The Watermark was published on March 5, 1995, and focuses on community issues with the LGBTQ+ (Lesbian, Gay, Bisexual, Trans, Queer/Questioning, and others) movement. The main topics discussed in this issue include Olympic athlete Greg Louganis (b. 1960), the incarceration of gay Christian activist Mel White, U.S. Supreme Court case Romer v. Evans, the selection of Michael Slaymaker as the new executive director of the Hope and Help Center of Central Florida, an amendment proposal in Alachua County that would prohibit county commissioners from passing ordinances that would protect civil rights based on sexual orientation, the military's violations of its "Don't ask, don't tell" (DADT) policy, gay adoption, and legal and medical issues related to human immunodeficiency virus infection and acquired immune deficiency syndrome (HIV/AIDS). This issue also includes various advertisements, letters to the editor, film reviews, comics, a travel section, a calendar of events, and personal classifieds. Original 32-page newspaper: The Watermark, Vol. 2, No. 5, March 5, 1995: Publications Collection, GLBT History Museum of Central Florida, Orlando, Florida. Digital reproduction of original 32-page newspaper: The Watermark, Vol. 2, No. 5, March 5, 1995. Dyer, Tom et al.. “The Watermark, Vol. 2, No. 5, March 8, 1995.” RICHES of Central Florida accessed April 22, 2019, https://richesmi.cah.ucf.edu/omeka/items/show/9250.